The source for news and information on the Rare Books and Special Collections Department of the Catholic University of America, Washington, DC. Unigenitus at 300: Selections from the Miscellanea Relativa alla Bolla Unigenitus. 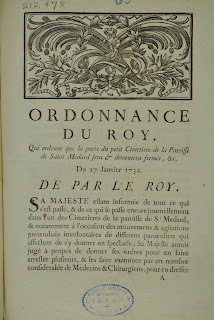 Promulgated in September 1713, Pope Clement XI’s apostolic constitution Unigenitus became the subject of thousands of books, journals, pamphlets, prints, broadsides and even card games. 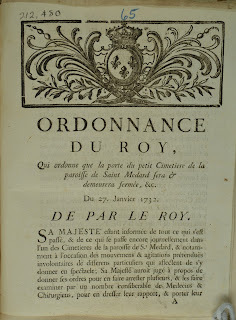 Debates over its acceptance by the French church and state spawned innumerable sub-controversies and lawsuits, on papal infallibility, the liturgy, government’s role in the Church, the refusal of sacraments, the rights of clergy and laity, miraculous cures, and popular religious movements operating well beyond the reach of academic theology. 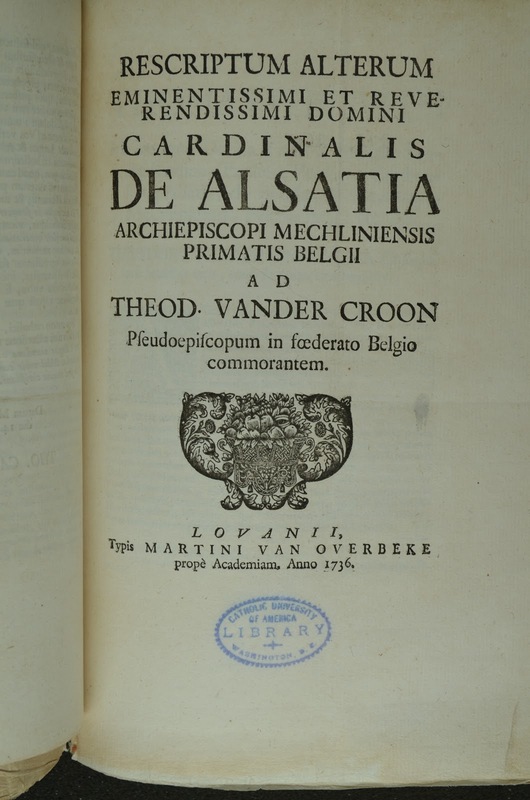 Members of Clement’s own family, most likely his cardinal nephews Alessandro and Annibale, assiduously collected titles that documented the Unigenitus war on all its ideological fronts. 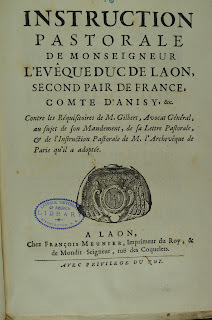 Volumes of the Albani Miscellanea include clandestine Jansenist publications, possession of which would have landed the average Parisian in the Bastille. 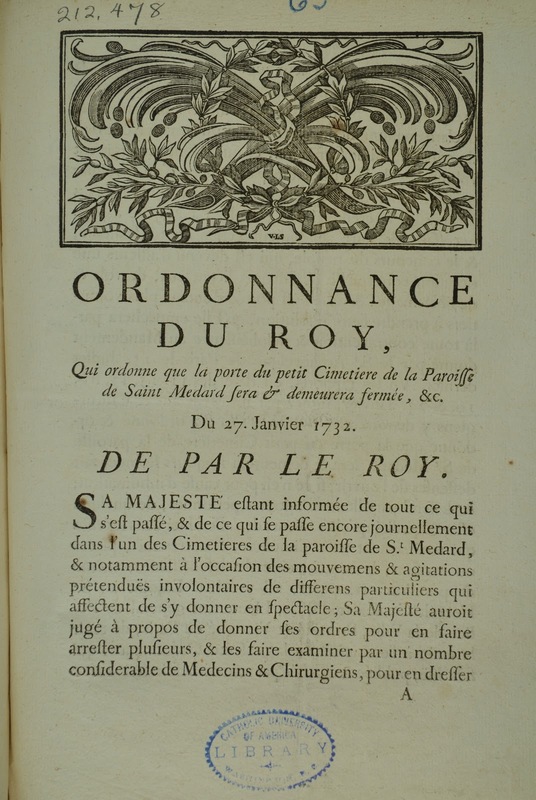 These are bound in disorderly counterpoint with works of anti-Jansenist polemic, most of them publications which the exasperated French king, Louis XV, would have been happy to suppress. 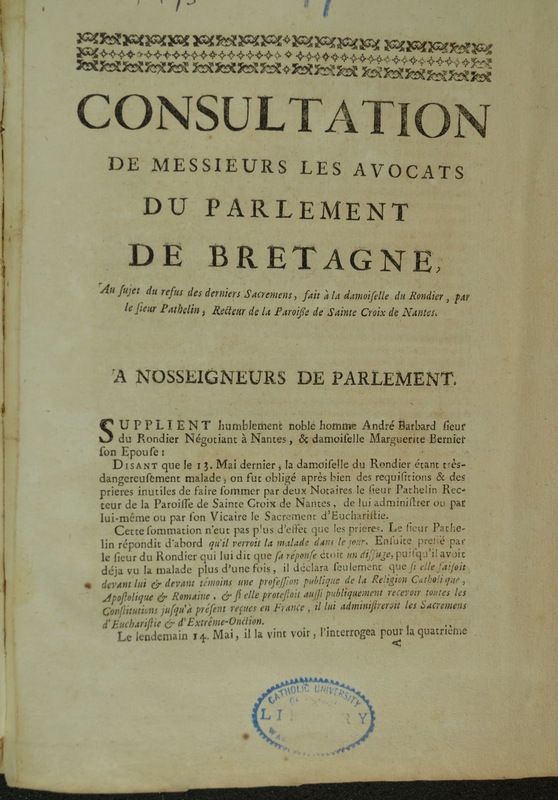 300 of these pamphlets (dating from 1709 to 1738) have recently been cataloged, with some 1000 or more soon to be added to WorldCat. Presented below is a small sample, in chronological order, of works encountered in the course of this project. From these few titles the reader may glimpse the diversity of the pamphlets' content and the complexity of the age which produced them. Together with matters directly relating to the Constitution, one finds the Church's social and pastoral concerns, evidence for natural disasters, legal issues, censorship and printing history, and occasionally, even humor. crops failed in the country, and reports circulated of desperate people eating grass like animals, an image which would endure, nurturing the pent-up bitterness of the ancien régime. 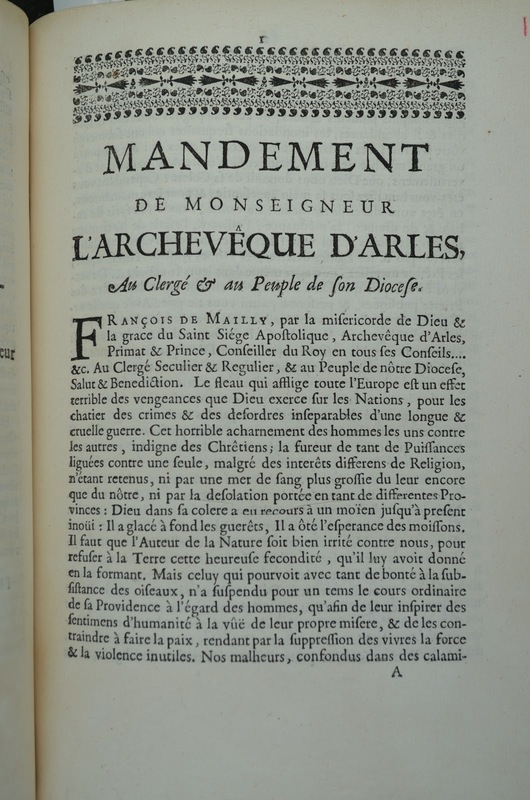 In this letter of 2 June 1709, François de Mailly, Archbishop of Arles, requests prayers for the time of famine, which he attributes to God's displeasure ("l'Auteur de la Nature soit bien irrité contre nous..." ) a formulaic statement perhaps from a man who could not have mentioned the truth, that the endless wars of Louis XIV made everything so much worse. But the writer's main object here is to propose, together with prayer, practical relief efforts for the poor – the sale of church silver to buy them bread. 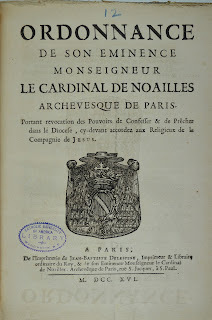 In this edict of 1716 Archbishop Noailles put the Society of Jesus under interdict within the Archdiocese of Paris. 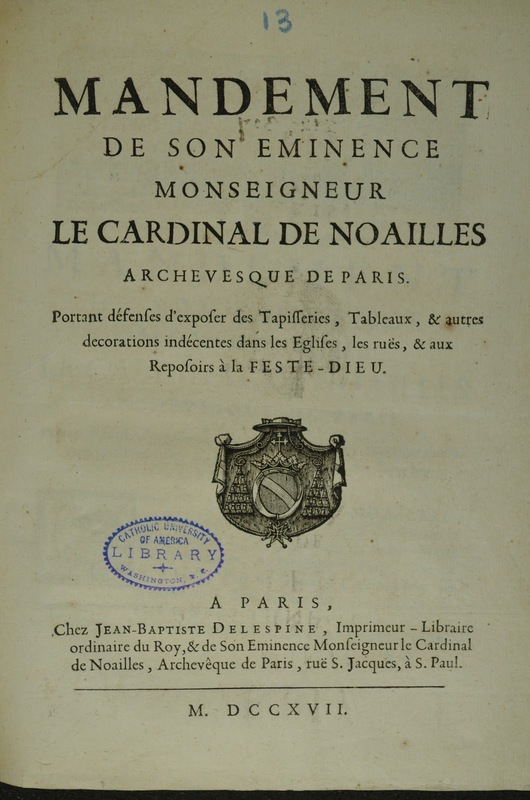 With this act (occasioned by an anti-Jansenist sermon preached a few days earlier by a member of the Society) the Jesuits were forbidden to preach or hear confessions, effectively curtailing their Parisian ministry until after Noailles’s death in 1729. 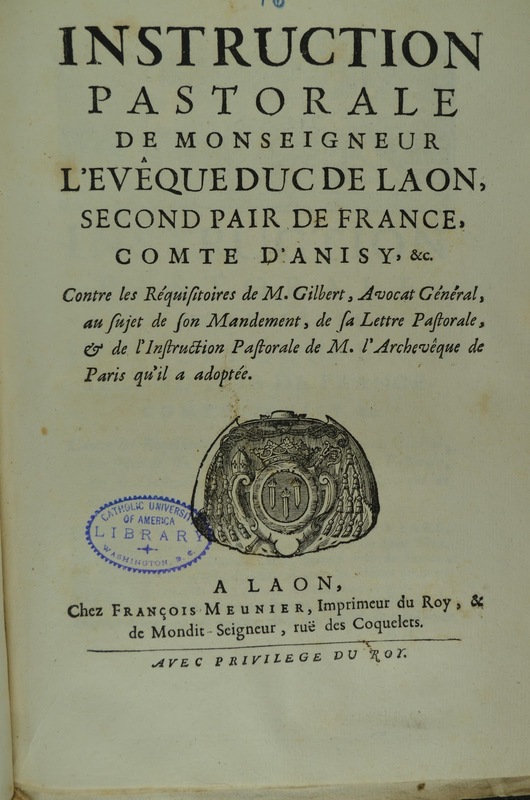 This pamphlet, concerned with one episode in the decades-long skirmishing between Jansenists and Jesuits, is an early omen of the 1764 suppression of the Society in France. 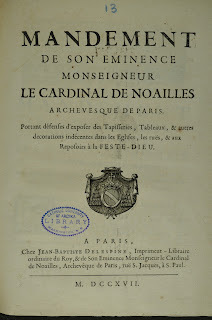 Another of Noailles’ archiepiscopal pronouncements, this one forbids the use of “indecent” tapestries and decorations in churches and wayside altars during Corpus Christi celebrations. The occasion for this decree is no longer evident to the modern reader, but was likely provoked by some incident which only time and research will reveal. The Great Plague of Marseilles. The last major European outbreak of the bubonic plague began when a ship carrying the infection docked at Marseilles in 1720. Within 2 years, more than half that city’s population had been wiped out. 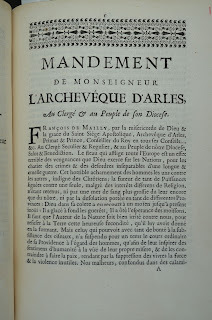 The disease, commonly called the Black Death, crept north, approaching the Diocese of Sisteron by December 1720, when bishop Pierre-François Lafitau issued this letter urging his clergy to stay and aid the victims. 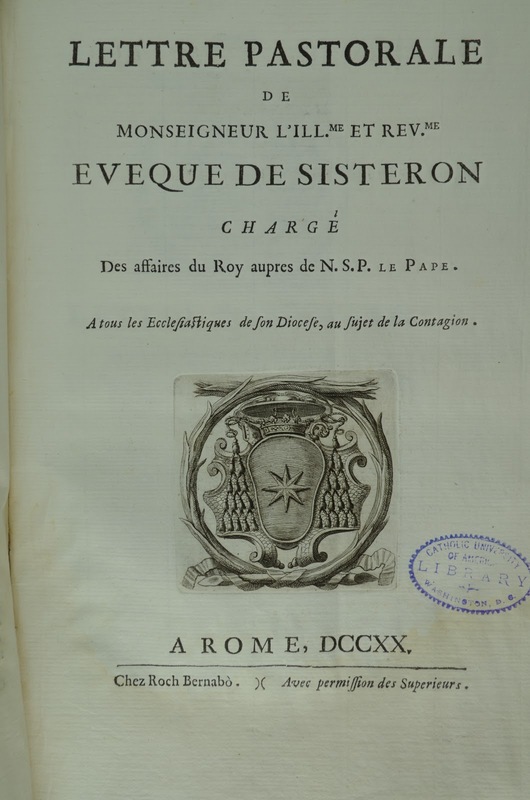 Printed on splendid Italian paper, with engravings of the bishop’s coat of arms, this elegant production seems out of place given the gravity of the situation, and Lafitau evidently wrote it from the safety of Rome. 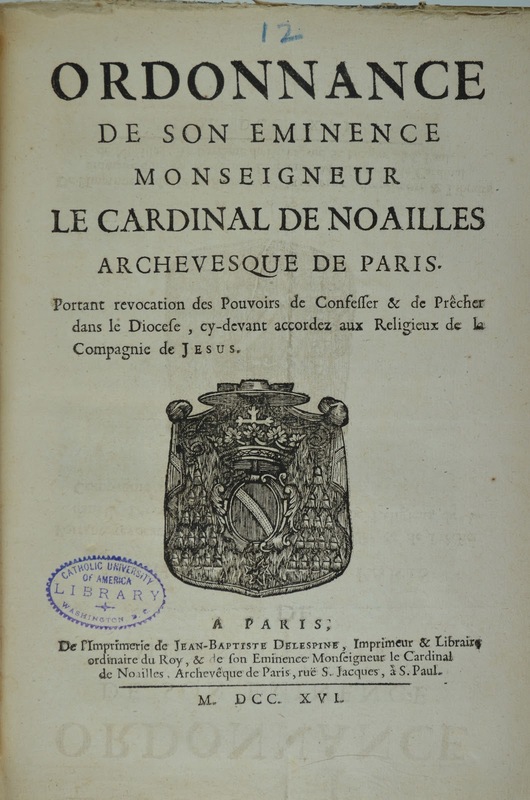 Nevertheless, in Marseilles and other areas of Provence, numerous clergy who did not hesitate to remain in harm's way succumbed to the plague in the course of their ministry to its other victims. The polemical nature of most of the pamphlets in the Miscellanea is evidenced by heated rhetoric between Jansenist sympathizers and their opponents, between the “acceptants” or “constitutionnaires” who welcomed the bull Unigenitus and its “opposants” and “appellants” who sought to bring the matter before a General Council. Amidst the mutual recriminations and excommunications, it is rare to find a document as charming as this one, a letter from the general of the Carthusian order urging the return of his runaway monks, appellants, who had fled to Holland to make their stand against Unigenitus. In terms of affection, yet with a reminder of their vows of stability, Fr. Antoine pleads with his "enfants prodigues" to return to their community. To err is human ... to cover up keep a woodcut handy. 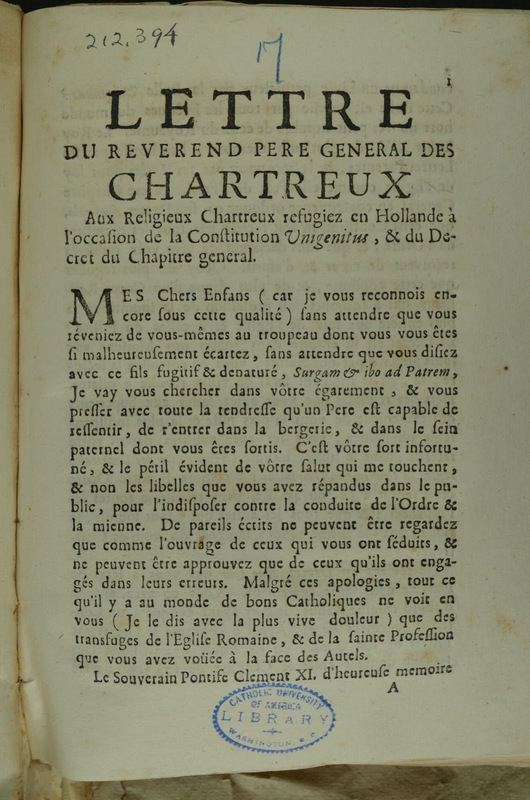 Étienne La Fare, the rabidly anti-Jansenist bishop of Laon, published relentlessly against his opponents, even after his printing privileges were revoked by the king. When theological issues were at stake, correctness of the text mattered, but in the publication shown below, there must have been significant errors or infelicities that were not meant to see the light of day. How did the printer cope? Reprinting the sheet would have been far too expensive. 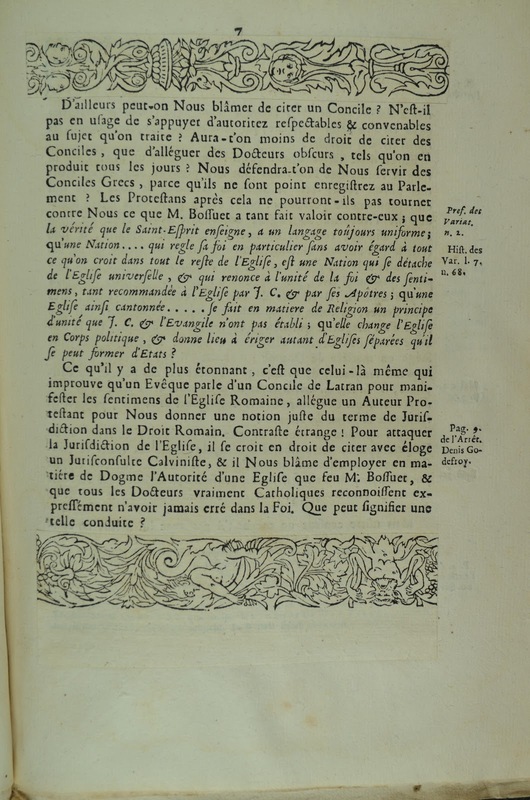 Instead, a few old woodcut borders were printed on thin paper, and the result used to cover up some large expanses of printed text at the top and bottom of the page. Slip cancels are common in eighteenth-century continental printing, but it is rare, in our experience, to find pre-printed decorations being pasted over offending letterpress passages. Slashed, burned and banned in Paris. 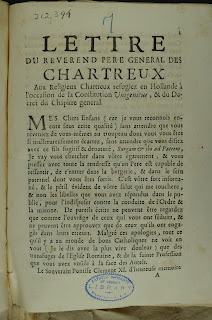 Approximately 20 percent of the pamphlets cataloged thus far involve governmental or ecclesiastical acts suppressing printed books, most often works that are pro-Jansenist, but sometimes propaganda on the other side. 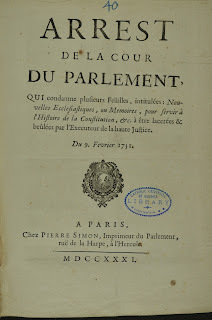 This arrêt prescribes the usual penalties for an illicit publication: to be shredded and burned by the public executioner at the foot of the grand staircase of the Palace. 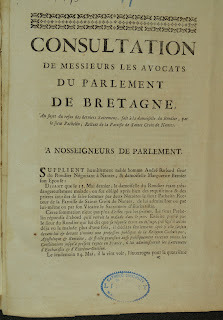 The object of this treatment is perhaps the most successful underground printing production of the 18th century, the long-running (1728-1803) Nouvelles ecclésiastiques, a weekly news sheet of anti-Constitutionnaire propaganda which eluded the authorities for decades. This Arrêt was not the first attempt to quash the journal which persisted by means of brilliant security measures, a network of independent and anonymous editors, printers, and distributors, unknown to each other and unable to give away the names of colleagues if arrested. Despite the best efforts of the police and the imprisonment of numerous booksellers and printers, the editors were never apprehended. A refusal of sacraments case. 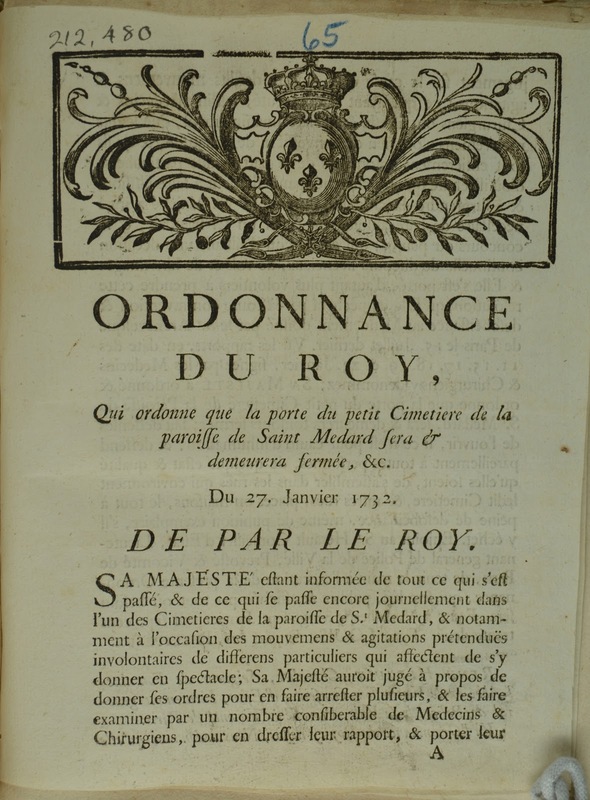 The reign of Louis XV was a litigious age and lawyers occupied the highest places in the Jansenist movement. The Unigenitus controversy provided them with plenty of clients, one of them the husband of a woman who had been refused the last sacraments because of her inability (or refusal) to state publicly her acceptance of all papal constitutions including Unigenitus. 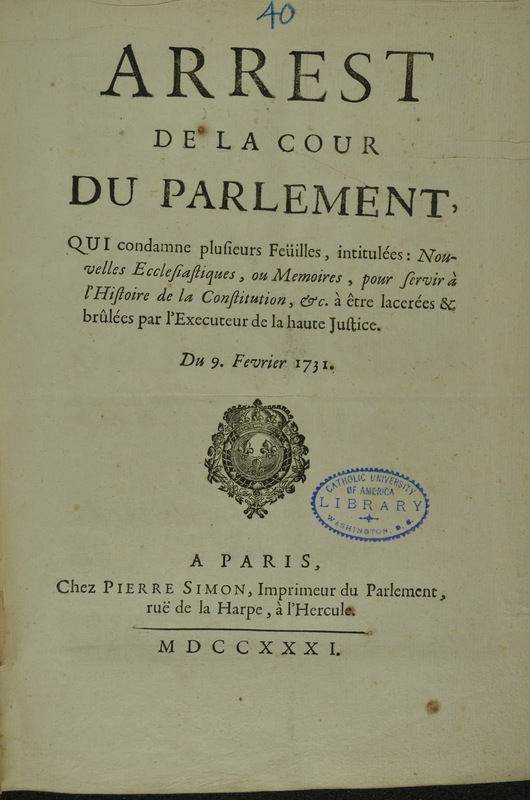 This is the text of his 1735 lawsuit brought in the Parlement of Brittany. In an age which took the sacraments seriously, it was not uncommon to refuse them to a person living in sin. 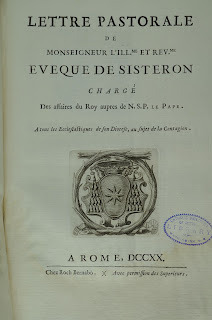 (The Jesuit confessors of Louis XV refused him absolution until he sent his mistress away). But holding the sacraments hostage to a person’s acceptance (or not) of Unigenitus, was loudly condemned, and, as might be expected, the subject of litigation. 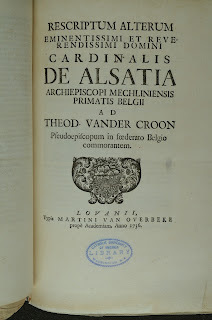 This rescript of the Archbishop of Mechlin responds to the publication of the Defensionem of the schismatic bishop Van der Croon who was at the time ruling in a see which the Vatican still regarded as vacant since the election of Cornelius Steenhoven by the Jansenist-dominated and government-supported chapters of Utrecht and Haarlem. The secession of the Old Catholics as they came to be known, was another piece of fall-out occasioned by the bull Unigenitus, the crux of the disagreement being the bull’s expression of papal infallibility, which would not be formally defined until the First Vatican Council. The undated work excerpted below has yet to be cataloged, but is one of a genre that we hope to discover more of in cataloging future volumes. Jansenists are seldom remembered for their sense of humor but they certainly evoked hilarity from their opponents. 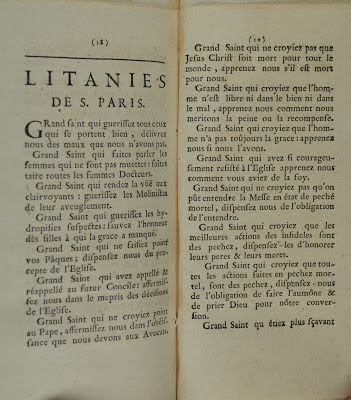 Here the author (probably G.-H. Bougeant) has penned a satirical litany in honor of "Saint" François de Pâris. 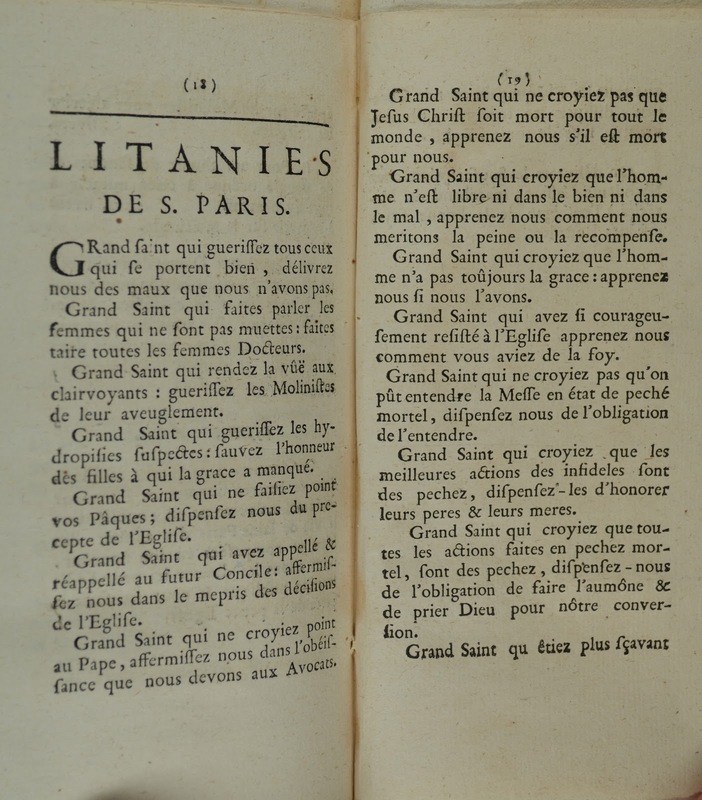 The author prays (among other things) that François, who can make mute women speak, might reverse the process, and suggests that the great saint who cared nothing for the Pope, should yet make us duly obedient - to lawyers. Researchers curious about other pamphlets in this collection may find them in the CUA Libraries' catalog. All items can be retrieved for browsing by a left-anchored title search using the phrase Miscellanea relativa. As always, we welcome readers' comments and corrections. 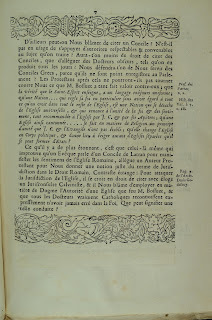 Curatrix is the nom-de-keyboard of Lenore Rouse, the Rare Books and Special Collections department curator who is responsible for the content of these pages and welcomes all comments and corrections thereon. The views expressed in this blog are her own and do not represent the views of The Catholic University of America.